A powerful manifesto for CEOs and managers alike, Beyond Measure reveals how organizations can make huge changes with surprisingly small steps. 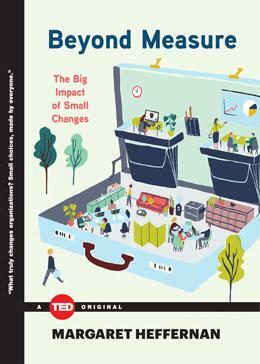 In this book, Heffernan looks back over decades spent overseeing different organizations and comes to a counterintuitive conclusion: it's the small shifts that have the greatest impact. 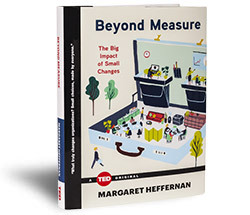 In this wise and witty guide to creating strong company culture, business leader Margaret Heffernan lays the groundwork for a new kind of thinking: Organizations can create seismic shifts by making deceptively small changes. Far beyond a prescriptive list, this book spills over with fascinating anecdotes from organizations around the world. Heffernan reveals the surprisingly small changes any organization can make: how to empower every person as a leader: how to open channels as a real, active listening; the important of cutting back hours (and also leaning into crunch time); why leaving the office does wonders for your working brain; how conflict works as an essential tool for creative thinking; why companies that actively solicit involvement beyond their walls are so much more effective; how simple activities strengthen social capital between workers. Packed with compelling stories and startling statistics, Heffernan takes readers on a tour across the globe. Drawing from her years of experience as a business leader and ultimately proving that it's often the small changes that make the greatest, most lasting impact. This book is aimed at everyone — from the CEO to the janitor — who wants a better place to work. It looks at the accumulation of small, everyday thoughts and habits that generate and sustain culture: ways of speaking, listening, arguing, thinking, seeing. These aren’t multimillion dollar, multi-year programs; these are small steps that anyone can take at any time, the small steps that mark the beginning of big change. Read a Q&A with Margaret on Huffington Post: "America's Competition Fetish Kills Creativity and Produces Human Sheep"
An illustrated excerpt from Beyond Measure on MEDIUM: "Small Steps to Huge Change"
Read what TIME has to say about Beyond Measure: "The Real Way to Fix Finance Once and for All"
A great synopsis of Beyond Measure in Tech Cocktail: "What Makes Some Teams Better than Others"
Read a wonderful review in The Globe and Mail: "Corporate culture the 'secret sauce' of success"
Margaret Heffernan is an entrepreneur, chief executive, and author. She was born in Texas, raised in Holland, and educated at Cambridge University. She worked for the BBC producing television and radio programs and also developed interactive multimedia products with Peter Lynch, Tom Peters, Standard & Poors, and The Learning Company. She has served as Chief Executive Officer for InfoMation Corporation, ZineZone Corporation, and iCAST Corporation. Her book, Willful Blindness, was named one of the best business books of the decade by the Financial Times, and her most recent book, A Bigger Prize won the Transmission Prize in 2015. She blogs for the Huffington Post and Inc.com.